I spotted this on the A train in the NYC subway today. If you remorselessly stole a respectable citizen's bike and have been caught, pinned to the ground, and arrested... you have rights too my friends. Now you can pretend you didn't do anything wrong, and call this number now to put forth your fake stories in. 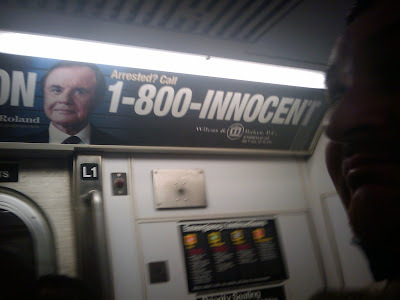 Call 1800-INNOCENT. Ofcourse, if I spot you stealing mine or any of my friend's bikes, I will run after you, catch you pretty quickly, and beat the living crap out of you. At which point this number will effectively become useless and you would need a totally different number. For the ambulance. [Changes facial expression] Keep an eye out for me. I guess you can use the 1-800-Innocent number if you decide to do as you have mentioned if someone steals your bike. Absolutely. It works either way. The convenience of telephones. Aah, the mind boggles. Well now enough people will read this so they can pass it on to the idiot that stole Lance's tt bike. KGS : This is a coincidental post. I had no CLUE about Lance's stolen bike. Ofcourse, my sequel post comes after this, addressing the thieves themselves.